I’m always looking for more quick and easy weeknight meals that can be made in under twenty minutes. I’ve been making a variation of this broiled salmon for many years and recently started seasoning it with Cajun seasoning. 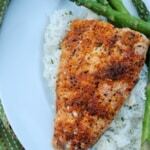 This Cajun broiled salmon has now made it onto my list of regular meals that we all enjoy. I like to serve it with rice or quinoa and a quick cooking vegetable like roasted broccoli or asparagus. It’s also good cut up on a salad with all of the toppings. Once you know how to broil fish, you can customize the seasonings however you like. Mustard sauces, sweet and spicy Asian sauce, or just simply butter with salt and pepper and lemon slices. It will become a super fast go-to healthy meal. For convenience and budget purposes, I buy a family pack of frozen salmon fillets at Aldi. They thaw quickly and make eating fish affordable and accessible for land locked states like my own. 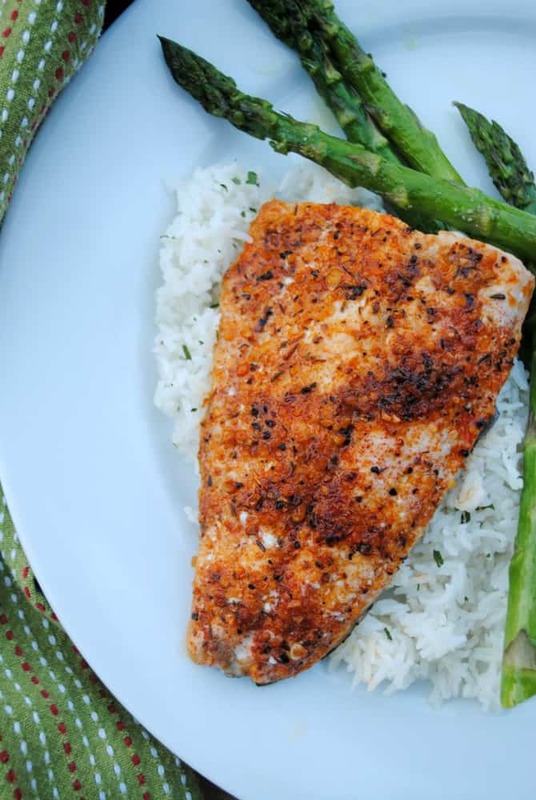 A quick and easy weeknight dinner of broiled Cajun salmon. Pat dry salmon filets and place in a baking dish, skin side down. Drizzle salmon with oil. You can also use a brush to evenly coat the fish. Sprinkle the salmon with an even layer of the Cajun seasoning. Broil salmon for 7-10 minutes or until fish easily flakes with fork. This will depend on the thickness of your fillet. Watch carefully as to not burn fish. You can always use different seasonings if Cajun seasoning is too spicy for you. Play around with the method and make it your own. If you like a crispy skin, flip it over and broil for a couple of minutes.